Waffles directly on the table????? I love Watco Danish oil and use it on most things I make, but I cover tops with Arm-R-Seal. I leave it bare on trim only. I think you are asking too much from it as a dinner table finish. If you put a drop of water on it does it bead up and sit there or sort of soak in? RobS888, I don’t know. I will check and see. Either way, what should I do if water does/does not bead? RobS888, I don t know. I will check and see. Either way, what should I do if water does/does not bead? If it doesn’t sit on it then it isn’t sealed. I imagine other things could soak in and spoil. I don’t think Danish oil builds a film finish or at least not much of one and you really want a sealed surface for your table. Either way I would use arm-r-seal. This is white oak with medium walnut Danish oil and several coats of satin arm-r-seal. I use a foam brush and it seems to level itself nicely. Thanks for the help. I was hoping I wouldn’t have to use anything else on the table, but I will let the table cure for several more days in my warm house and then I will consider Arm-r-seal if I am not satisfied with the oil finish. Danish oil is insufficient for a dining table top, but no need to worry. Let the oil finish cure for a couple of weeks, use a table cloth when eating to keep stuff from absorbing into it. Then do what you did with the oil but use poly (arm r seal, minwax, it doesnt matter) thinned 1:1 with mineral spirits. To get a better film build, wipe it on but not off. For more film, only thin 10-20% and brush on. Good sponge brushes work well. Don’t be intimidated by the arm r seal. IMO its one of the most forgiving finishes out there in terms of application. Another option, that’s not oil based (read a little stinky) is their high performance. Its water based. Both product level themselves very nicely. I like to apply one to two coats full strength with a brush and then the last few coats thinned, with a rag. But, like said above, Danish oil may take up to a week to cure and fully dry. I know all about getting the kid fed before you head out the door. Anything you can manage to stuff down their throats is a good thing! Don t be intimidated by the arm r seal. IMO its one of the most forgiving finishes out there in terms of application. Another option, that s not oil based (read a little stinky) is their high performance. Its water based. Both product level themselves very nicely. I like to apply one to two coats full strength with a brush and then the last few coats thinned, with a rag. But, like said above, Danish oil may take up to a week to cure and fully dry. Thanks Chrisstef . And the water based high performance will work on top of the Danish oil? Doh. That didn’t equate in my tiny little brain for some reason. It might but I wouldn’t risk it. 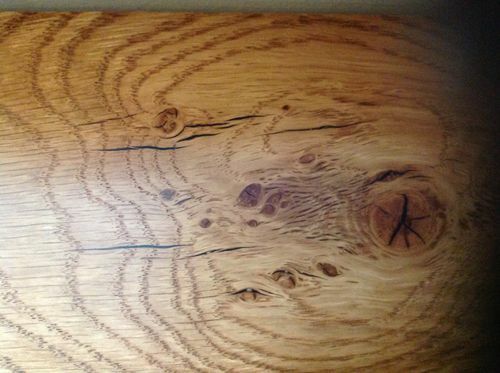 You could use a sealcoat of dewaxed shellac over the Danish oil and then the high performance on top of the shellac. I would go that route myself because I like shellac but its got a little learning curve to it. Stick to the oil based arm r seal. Yikes, next time give them Watco for syrup and they will refinish the table. Just kidding, don’t do that. Watco is not a very durable finish for a table top, especially if you have kids. Oil base poly is about the most durable finish out there and is what I would use in that situation. You’ll have get your finish room warmer though. You can put oil base right over the Watco after it cures for at least a week. I concur w/ OSU55’s advice. Thanks for the help. I was hoping I wouldn t have to use anything else on the table, but I will let the table cure for several more days in my warm house and then I will consider Arm-r-seal if I am not satisfied with the oil finish. I just use a foam brush and lay it on pretty thick. When the top is covered I run the brush very lightly and slowly at an angle (maybe 45 degrees, the brush is behind my hand ) on the surface. When you are applying, brush off the ends from a few inches in. This way you won’t get drips and build up on the edge. Keep running around the full edge to make sure none drops off. When I think it is fully applied I look at it from a couple angles to make sure I haven’t missed any spots or have streaks, then leave it alone for 12 hours or until the next day. Don’t laught, but I get close and sniff it to make sure it is ready for the next coat. Then I lightly sand with 600 grit. I blow off all the dust, then rub my hand on the piece to see if there is any dust left, then do it all again. The piece I showed had at least 6 coats on it. The last very light sanding is at 1,000 grit. It really is easy to work with. I started with a pint or quart, but I’m on my second gallon jug now. I use Danish Oil on a lot of projects and for me it takes awhile to dry. Certainly, at the temperatures you are at, it will take extra time. I am very surprised, thrilled, and thankful for all the advice I have received from the respondents in this forum. Let this serve as a GIANT THANK YOU to everyone here. I have posted the same initial question to a few other outside experts and/or forums with depressingly minimal response. Looks like I need to give the table more time to dry, then work on finishing it with Arm-R-Seal. I will be happy to record before and after photos and update the forum in the future (likely a few weeks from now).